Good Morning, I wanted to start off by making some corrections to previous posts. The first was my description of how Mestinon works. It doesn't send more messages, it actually allows the acetylcholine to hang out at the neuromuscular junction longer allowing it to have a better chance of hitting on a healthy muscle receptor. I'm super tired today, which leads to brain fog and since I didn't write them down I will have to post the rest of my corrections at a later time. Oh, I remember one more, I had asked for prayer for my father in law, keep them coming. His surgery was supposed to be this week, it is now going to be at least 3 weeks out, maybe more, pray for a cancellation. Our family had a wonderful day yesterday. We had a birthday party for John. It was a pool party for him and four of his friends. We timed it between check out and check in so they had the whole pool and a lifeguard to themselves. 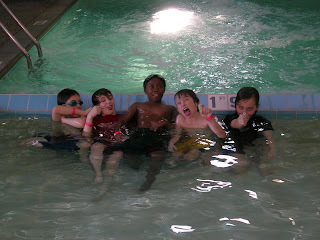 Five 10 year olds each armed with two squirt guns, goggles, and a large indoor water slide = FUN! Back to the subject of work. My big meeting went very well. I will be putting in more hours because it has been decided that I may work from home!!!! The difference between waking up, logging on, forwarding my phone, taking a real rest during lunch hour, and hopping back on for a few hours versus waking up, getting dressed and prettied up, driving 25 minutes to work, and then working will give me a MUCH MUCH better chance at returning to work healthy and productive. I will start my new schedule tomorrow. Thank you everyone for your support, even though most of you don't know how to sign up to follow the blog:) At least you email your feedback.